Recently, C. at Romaniaexperience.com had a cost of living post which listed the prices of some common food. I promised to do the same thing so we could compare. I decided to get prices for most of the things he has listed so it would be an apples to apples comparison so to speak. The apartments come furnished here, right down to plates etc. It may not be to your liking in the older apartments, but hey..These prices are for modern flats. Utilities for 2 people will run about $94, which includes electricity and water. Once you register yourself as a resident, it drops by an average of 25%. This is a recent occurrence and conform with the E.U rules. We are hoping our next bill will drop to about $70 as we have sent in our paperwork. These prices are average for residents. The van comes around daily selling fresh veggies. You may pay a bit more to begin, but once you patronize the same guy and they realize you are not a tourist, the price drops quite a bit. As you can see, our cost of living is similar to his in Romania. The minimum wage here is just about €5/hour, with the average person making 800-1000 Euros per month. It is quite low compared to a lot of other E.U. Nations. This explains why is is one of the top retirement spots, especially for the British people. NextIstanbul Is A Turkish Delight! I remember visiting Bucharest, such a beautiful city. Wish I could go back. It looks gorgeous from the pictures for sure. It’s one place l plan on visiting. Thanks for stopping by. Wow, very affordable given the stereotype I have for European expenses. We have been delaying visiting Europe since the Euro is so high compared to the USD, but I’m starting to realize prices are very localized. We might have to limit a trip to the big cities to a shorter period of time and spend most time in a moderate cost of living place. Food for thought so to speak eh??? Hah hah!!! It’s definitely something to think about isn’t it? There are still some places that are affordable in Europe. Not many, but there are some. 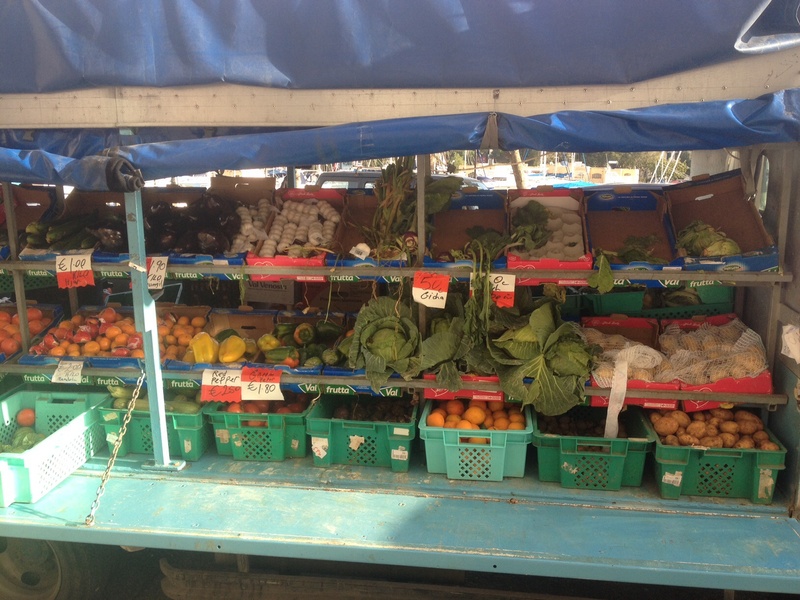 The pic is the vegetable stand that we buy from, it is literally downstairs, everything fresh. Now, if l don’t have an apple or tangerines daily… I don’t feel right, never used to eat any fruit. I have no idea how come I missed this article! Indeed, the prices are similar to those in Romania and I would dare to say that the deal is better, because of the weather there. :) The bread is pretty expensive there, though – glad we don’t eat much. 400 per month?? That’s insane. I thought for sure Malta would have the lowest wages. The bread size is 500gm, l think yours was 300gm, so maybe that makes it closer. You can’t beat the weather like you say. The only thing that would make it better would be if this place was a hub for air travel, but you can’t have everything. How are you holding up? Wishing good things for you.